These HSS-R, twist drilll bit is made of high speed steel manufactured to DIN 338 standards. 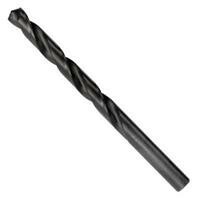 A right-hand rolled spiral fluted, twist cutting drill bit, type N, with 118° tip. Bosch HSS-R, DIN 338 Metal Drill Bits are suitable for drilling into alloyed and unalloyed steel up to a tensile strength of 900 N/mm², non-ferrous metals, cast iron and hard plastics.